Our claims line remains open 24hrs a day. Normal opening hours commence on Tuesday 23rd April. Bollington has been insuring a vast array of clients – from sole traders to corporate businesses – since 1974. While we offer professional indemnity, public liability, employers' liability and other essential commercial combined insurance covers we know that every business is different, and work hard to understand your needs. Whatever your size or location, we can provide quick quotes, highly competitive premiums and instant cover, with flexible payment options available. We work with a wide range of insurers to get the best deal to suit your needs. Bollington specialise in care, charity and not-for-profit sectors. We understand not all care homes are the same, so cover is tailored to cover your organisation and its unique requirements. Trust the expert Bollington team to find you the right home, motor and travel insurance policies, and make sure you're paying no more than you need to. If you need insurance for anything from a single van to a mixed fleet of vehicles, Bollington has the expertise and the buying power to offer the best value for money products to meet your needs. For over 40 years Bollington Insurance has been one of the UK's leading corporate insurance brokers. We provide specialist solutions for businesses of all types and sizes from sole traders to international organisations. With long-standing relationships with leading insurers we're well placed to find you the right policy and negotiate preferential terms. Apologies, we are currently experiencing a temporary connection problem with our phone lines at our Altrincham office. Please call 01625 854300 if you require assistance. Thank you for requesting more information from Bollington. Please complete the following fields to view the selected document. A fire in a car repair workshop on the Isle of Wight has destroyed the unit and spread to adjoining premises, causing major damage. The blaze broke out at a workshop ramp at Tee Jay Motors garage in Medina Village in Cowes. In addition to a number of cars at the garage, boats and gas cylinders were stored in the units and 30 cylinders had to be removed from the premises before they exploded. The tools of the trade are often potentially hazardous and care should be taken when working with flammable substances. It is also important to ensure your workshop has adequate levels of motor trade insurance, which covers your equipment, customers’ property and the fabric of your building. 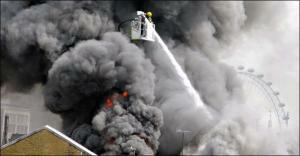 Forty firefighters were called out to the Cowes blaze which spread 100 metres by 100 metres at the height of the fire. The police helicopter was also deployed so its thermal imaging equipment could be used to keep tabs on the temperature of the gas cylinders still on the premises. Due to thick smoke coming from the fire, local people were advised to keep their doors and windows closed, and a number of local roads around the scene were closed. Two people were treated in hospital for the effects of smoke. Isle of Wight fire service said that the blaze started when a spark from welding equipment at the garage ignited on contact with a fuel source. The mechanic tried to put it out with a fire extinguisher, but the flames spread to the roof. It spread from the garage roof to the connected neighbouring units. Other businesses, including a clothing firm and Cowes Carnival also lost stock and equipment. Organisers of the carnival, which is in its 120th year, said they would not give up and have appealed to other local businesses to provide them with premises until the unit is repaired. How can SMEs prepare for Brexit?